On April 30th 1915, the Lusitania was at New York, being loaded with meat, medical supplies, copper, cheese, oil and machinery, but she was also secretly being loaded with munitions for Britain for the war. That same day, Kapitänleutnant Walter Schwieger was ordered to take his U-boat-20 German submarine to the northern tip of Great Britain, then back down south on the Atlantic side and then east to the Irish Channel to destroy ships going to and from Liverpool, England. Then he was to go around Ireland and head back to Germany. Schwieger was known to frequently attack ships without warning them, and fired at any neutral ships he suspected may be British. In an earlier voyage, he narrowly missed hitting a hospital ship with a torpedo. His reputation made it more likely for him to destroy a British passenger liner, such as the Lusitania. Travellers intending to embark on the Atlantic voyage are reminded that a state of war exists between Germany and her allies and Great Britain and her allies; that the zone of war includes the waters adjacent to the British Isles; that, in accordance with formal notice given by the Imperial German Government, vessels flying the flag of Great Britain, or any of her allies, are liable to destruction in those waters and that travellers sailing in the war zone on ships of Great Britain or her allies do so at their own risk. IMPERIAL GERMAN EMBASSY WASHINGTON, D.C., APRIL 22, 1915. This notice was thought by most of the passengers as an idle threat. Before the voyage, it was decided that only 19 of the 25 boilers would be utilised for the voyage because of the enormous consumption of coal, so boiler room 4 was shut down. This limited the Lusitania's speed to 21 knots, still much faster than a U-boat submarine's top speed of 13 knots. On May 1st, 1915, the Lusitania embarked on its 202nd crossing of the Atlantic with 1257 passengers, plus a crew of 702. It was under the command of Captain William Turner. The first days of the voyage were uneventful, but not for the U-20. On May 5th, Captain Schwieger rounded the south-west tip of Ireland. He tried to destroy but missed several ships, including several neutral ones. That day, he spotted a small schooner, the Earl of Lathom. He surfaced to warn the crew, then destroyed the boat with gunfire. The next day as he continued further east in the Irish Channel, he fired two torpedoes at the Candidate, a 5858-ton steamer from Liverpool. About two hours later, he destroyed another ship, the Centurion. The British never warned the Lusitania of these sinkings which were taking place near where the Lusitania was about to travel through. The U-20's fuel was running low so Schwieger decided not to travel past Liverpool, and instead turn back. The U-20 and the Lusitania were going to cross paths. On May 7th, the Lusitania entered the Irish Channel. Captain Turner slowed the ship down to 15 knots because of the fog. This was contrary to orders to travel at full speed in the submarine war zone around Great Britain. However, as a precaution, Captain Turner posted extra lookouts and swung the lifeboats out. At about 1:30pm, just after the passengers had eaten their lunch, Captain Turner went down to his cabin, probably to go the the bathroom. At about 1:39pm, lookout Leslie Morton, of only 18 years of age, saw a burst of bubbles about 500 meters away. Then a trail of bubbles began to approach from the starboard (right) side of the ship at about 22 knots. Morton grabbed his megaphone and shouted to the bridge: "Torpedoes coming on the starboard side." The officers there did not hear him. About 30 seconds later, Thomas Quinn, a lookout high above in the crows nest, saw the torpedo's wake and sounded the alarm. Captain Turner ran to the navigating bridge, and as he reached it the torpedo detonated. There was a large explosion similar to a crack of thunder at the side of the ship just ahead of the 2nd funnel. Then there was a second, larger, muffled explosion that seemed to come from the bottom of the ship. The ship tilted to the right side at an angle of 25°. The power suddenly failed, but Captain Turner still attempted to steer the Lusitania toward land in an attempt to beach her. The rudder and engines did not respond (obviously). Also, the watertight doors in the ship could not be closed unless there was power. The wireless room had to run on battery power to tap out its S.O.Ss. As a result of the list (tilt) of the ship, the lifeboats on the port (left) side could not be launched. The starboard-side boats were swung out so far as a result of the list that many passengers had to jump from the deck to the lifeboats, risking falling into the water many storeys below. Many crew members panicked and a few lifeboats were launched that contained only crew members. Other lifeboats capsized, and one or two were damaged when the torpedo hit the ship. 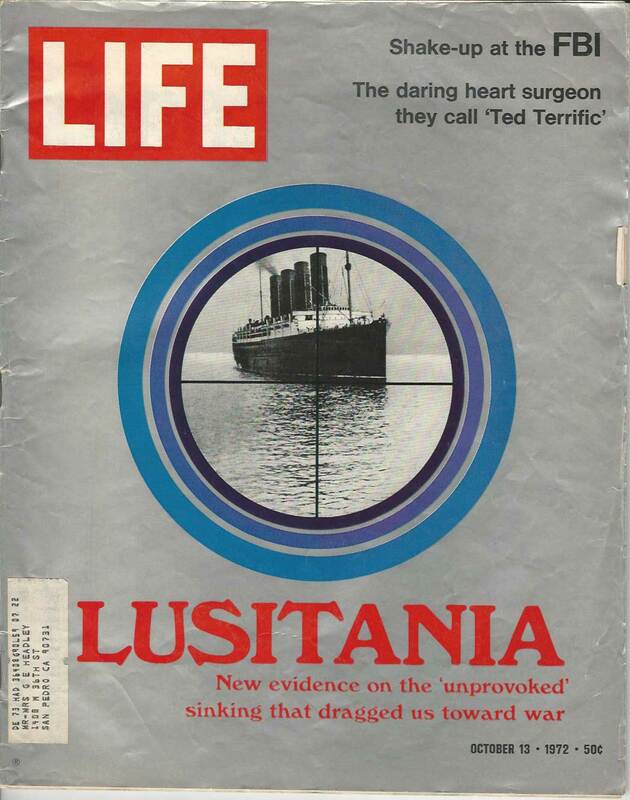 Although the Lusitania had adequate lifeboats for all on board, most lifeboats simply could not be launched. The Lusitania sank below the waves shortly before 2:00pm. It sank in 90 meters of water, and since the Lusitania was 239 meters long, the bow (front of the ship) hit the bottom of the ocean while the stern was still up in the air. Captain Turner jumped into the water as the bridge was about to go under. He swam for about 3 hours, until he finally found a nearby lifeboat, which was being swarmed with people trying to survive. A Canadian told some people to leave the boat to prevent it from collapsing. Turner decided to stay on the lifeboat. The U-20 saw all this. Schwieger made the following note in his war diary: "An unusually heavy explosion takes place with a very strong explosion cloud (cloud reaches far beyond front funnel). The explosion of the torpedo must have been followed by a second one (boiler or coal or powder?). The superstructure right above the point of impact and the bridge are torn asunder, fire breaks out, and smoke envelops the high bridge. The ship stops immediately and heels over to starboard very quickly, immersing simultaneously at the bow. It appears as if the ship were going to capsize very shortly, Great confusion ensues on board; the boats are made clear and some of them are lowered to the water with either stem or stern first and founder immediately. On the port side fewer boats are made clear than on the starboard side on account of the ship's list. The ship blows off [steam]; on the bow the name "Lusitania" becomes visible in golden letters. The funnels were painted black, no flag was set astern. Ship was running twenty knots. Since it seems as if the steamer will keep above water only a short time, we dived to a depth of twenty-four meters and ran out to sea. It would have been impossible for me, anyhow, to fire a second torpedo into this crowd of people struggling to save their lives." Many claimed that Schwieger added the last sentence after the voyage after the world became shocked by the sinking. The distress signals sent from the Lusitania reached Queenstown, a city in Ireland about 17 kilometres away. 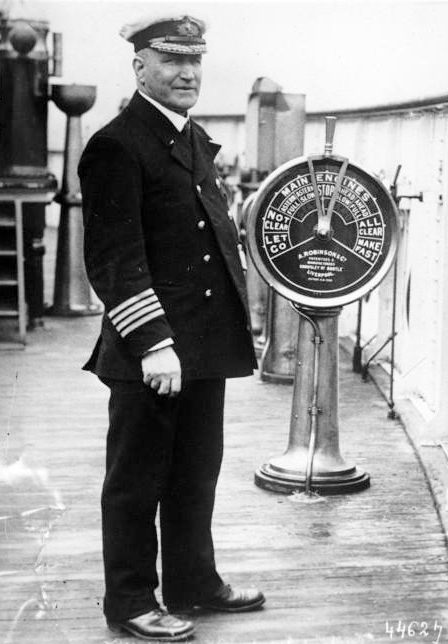 Vice Admiral Sir Charles Coke gathered up whatever ships were available (they were all relatively small) and told their captains to sail to where the Lusitania was. They arrived 2 hours after the sinking. When they got there, they picked up any people still alive in the water and only 6 lifeboats, which were all from the starboard side. The disaster was not over yet. Seven hundred sixty-one people were picked up by boats from Queenstown. One thousand one hundred ninety-eight people perished, this death toll was rivalled only by the Titanic disaster. Many survivors were dazed at first. Then they became enraged at the Germans, and many claimed that they placed the "notice" beside the CUNARD ad because they were planning to destroy the ship. Many survivors lost family members, and in some cases, entire families were wiped out. Riots occurred in many countries, and many stores refused to serve Germans. The U-20 continued its journey back to Germany. It tried unsuccessfully to sink two ships. Schwieger again changed his course to avoid an area where he suspected British patrols would be, especially after his notorious sinking. He arrived at Wilhelmshaven, Germany on May 13th. The Americans were particularly enraged by the Lusitania disaster. One hundred twenty-eight Americans were lost on the British ship out of 197. This was after many protests of Germany's unrestricted submarine warfare, in which many neutral ships, including those of the United States, were sunk, and some without warning. On May 13th, President Woodrow Wilson sent the first of four Lusitania notes to Germany. Anti-German protests and political cartoons appeared. Germany tried to find ways to defend itself against these attacks and protests. 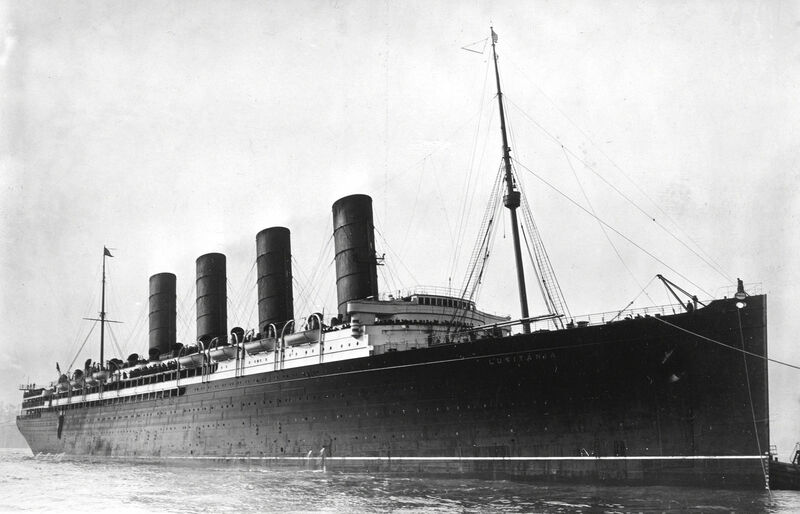 It claimed that the Lusitania was armed and that it was carrying munitions for the destruction of German soldiers. The first claim was a false claim, and although the British denied it, the second claim was proven to be true many years later in secret British documents. Who To Blame - The Juno Cruiser? The cruiser Juno was within the area of the disaster, but did not pick up a single survivor. This old war ship was briefly chased by the U-20 earlier that day and docked nearby. When she received the distress signal she hurried out toward the sinking luxury liner, but turned back (while close enough to be seen by the people in the water), because of an official "recall signal" from the Admiralty. At first, one might think that the Juno could have saved many lives, but after careful investigation, we are leaded to think otherwise. Some passengers were assured that the Lusitania would be escorted safely by a destroyer while in these dangerous waters, but the Juno couldn't do that job. She was an old ship, and although built for travelling at up to 19.5 knots, she could probably only attain 18 knots. The Lusitania would have had to slow down to let the Juno catch up, and travelling slowly in submarine-infested waters was not a good idea. And since the Juno was offensively armed while escorting a ship, the Germans could easily have claimed that the Juno was guarding a ship carrying troops, and both would be liable to destruction without the slightest warning. This is why the Juno can not be blamed. Generally, the Americans believed that the Germans were violating the rights of humanity with its torpedoing without warning of the Lusitania, but the Germans had their reasons. Many Germans claimed that the British deliberately exposed the Lusitania and tried to get it sunk to embroil the Americans, and get them to join the war on their side. In 1916, the American ambassador to Germany interviewed the Kaiser (ruler of Germany) and found that he believed the ship was going slowly in dangerous waters so that it could be easily destroyed. Captain Turner violated 5 top-secret Admiralty instructions, including zig-zagging, travelling near the middle of the (Irish) channel and avoiding headlands (such as the Old Head of Kinsale, 10 km away). Turner claimed that zig-zagging was a waste of time and thought that the Irish Channel was much narrower and therefore travelled closer to land. And why didn't the British Admiralty warn Turner of the sinking of the Centurion and Candidate? Then the Germans claimed that the Lusitania was carrying Canadian troops. There were 360 Canadians on board on that fateful voyage. None of them were soldiers, although at least one of them was planning to enlist in the Canadian Expeditionary Force. But since he was not yet a soldier, he was still an innocent civilian. The Germans also tried to justify the sinking by saying that the British were using their "illegal" blockade of stopping and confiscating ships carrying cargo to Germany in order to starve the German citizens, and this nation-wide suffering was worse than the suffering of the victims of the Lusitania disaster. The points against Germany were more obvious than those against Britain. First of all, the British and all the neutral countries hated Germany's unrestricted submarine warfare. Germany claimed that their blockade was in response to Britain's blockade of capturing their own ships. But no one gets killed in a blockade like Britain's, and people, including innocent civilians die in unrestricted submarine warfare. Second, the British could have blamed Walther Schwieger, who destroyed many neutral, passenger and hospital ships, and some without warning. If Schwieger didn't mean to sink the luxury liner, he should have been able to see that it was a passenger ship, and save his torpedo.